Before you can enter Erika's Tower you should have taken the evidence from the Slime Quest to Berra and spoken to Anaximander about the information. If the Golems won't move off the bridge leading to Erika's Tower then you've missed a step. Read your journal to make sure that Berra has told you about the evidence. Upon entering the tower you will see Erika standing on a platform in the middle of the room. Check the books around her. One of the green ones teaches Haste Lv.3. The only way to tell which one is to pick them up and use them. Once you've got the spell talk to Erika. When given the option choose to ask her to teach you. She'll teach you some Mage Spells, and if your reputation is high enough she'll teach you the special skill Magery. This skill is good for both mages and priests, but it's pretty expensive to buy. After you're done learning ask her about the boon she wishes to grant you. She'll tell you to bring her an amulet, and where the amulet is. Once you have it bring it back to her and accept her boon. This will be very important in the end game. After you're done with Erika head out of this room to the east. The first two doors in this hallway lead to rooms with trapped floors. They'll both damage you, and the only way out of them is through secret passages. There's a secret passage between the middle and bottom of the dividing wall, and another secret passage near the southeastern corner of the room with the lava that takes you outside. The next door in this hallway leads to a little alcove. There's a secret passage on the southern wall which takes you into a large workroom. In the center of this room are a pair of Drakeskin Gloves resting on a pillar. The pillar is surrounded by barriers which require either Dispel Barrier Lv.2 or a Piercing Crystal to get rid of. Once the barrier is disrupted you can pick up the Drakeskin Gloves, but you'll also have released some quickfire which will quickly cover the entire room. It's up to you whether the gloves are worth it or not. The next room is where Erika keeps her livestock, if you're interested in that sort of thing. The next door is on the opposite side of the hall from all the other doors. It leads to a holding area. There should be a lever near the door that controls the Portcullises in this room. The first cell contains an Experiemental Fungus. Once you've killed it, it will drop a Fungoid Spine, which is a weapon. The next cell contains three Ice Puddings, and the final cell contains an Experiemental Rat. The last room in this hallway leads to a room with some pillars forming a square in the middle. Go right through this room and you'll enter another room with four chests and a rune on the floor. Getting near the chests will trigger a trap in the previous room. I usually go into combat mode as soon as I've opened this door, and send my weakest character in to stand near the rune between the chests. The square in the first room will open at one end, exposing a Demon. Seems fairly easy, right? Unfortunately there are four enemies you can't see. There are three Guardians in this room, who are difficult to fight as it's kind of hard to pinpoint their exact location. There's also one Black Shade, which is easier to find since it uses magic. Just watch for where the magic attacks originate and you'll have found your black shade. Once you've disposed of these creatures go back into the room with the chests, shut the door and loot at your leisure. The first chest contains a nice lot of coins. The second chest contains a lot of mushrooms. The third chest has two rings. They both look the same, but one of them is cursed, so you don't want to equip either of them until you're sure which is which. The cursed ring is the Ring of Idiocy, and the second is a Nimble Band. The final chest contains a Cursed Greatsword and a Fire Orb Charm. Leave the sword and take the charm. Now go back to where Erika is and then head down the western hallway. The first door is a smithy, and there isn't really anything terribly useful in here. The second room contains quite a few potion making herbs and a couple other nice goodies. It also contains two Black Shades. Once you've located and killed them take whatever you want and move on. The next room is another little alcove. Again, check the southern wall for a secret passage. This room contains quite a few pillars and a brazier in the southeastern corner. If you get too close to the Brazier you'll find yourself stuck in some quickfire again. Next room is where you pick up the amulet that Erika asked you to fetch. The next room is a real pain. The room appears to be completely filled with pillars, but there is a path through. Start by zig-zagging back and forth to near the western wall, then head down the western wall and along the southern one. When you get the message that you see something, take the item and get ready for battle. Taking the item, which is a Diamond Dagger, releases an Ur-Basilisk. You might want to wait until you have a higher level party to do this room, and if you have any items that protect from petrification you want to equip as many of your characters with one as possible. At the very least make sure that the person who will be closest to the Ur-Basilisk is wearing either a Crystal Charm or the Fungal Armor you picked up in the Slime Pit. You'll have to make your way back to the door still in combat mode, since there isn't enough room for your entire party. Once you're back in the hallway go out of combat mode and move along. This door is again on the opposite side of the hall. This leads to another holding area. There's a lever right beside the door that controls the Portcullises in this room. The first cell, which is right in front of you when you first go through the door, contains an Augmented Giant. He'll drop a few coins when you've killed him. The next cell over contains a few Ruby Skeletons. Ruby Skeletons sometimes drop rubies once they're slain. The final room contains the body of an Empire Soldier. The only thing of note on the body is a Steel Longsword. The last room in this hallway contains a pillar and a rune. Stepping on the rune causes the pillar to throw a Fireball at you. Leave the tower and move around it on the outdoor map until the little red dot that represents you on the mini-map is directly behind Erika's Tower. Using this method is much easier than just trying to guess when you're behind the tower. Once you're in the right place, enter the tower from back here and you'll find yourself looking at a passage leading south. Head down the passage until you come to a place where it splits north and south. There are some cave slimes to either side. Once you've dealt with them head south and east. Prepare for battle when you get a message that it sounds like there's something ahead of you. There's a Gorgon around on the corner, and you want to get one of your fighters right up next to it as soon as possible. This will cause it to use physical attacks rather than attempting to turn your party into stone. Once you've killed the Gorgon check the ground for a Wand of Forcecage. Head back down the hall to where you battled the Cave Slimes. Instead of heading back north push against the western wall to find yourself outside the tower, but not on the outdoor map. The very northwestern corner of the tower contains another secret passage leading in to a small back chamber. There are a few gemstones on the workbench that you can pick up, and you want to check out the Vahnatai dresser to gain another level in Vahnatai lore. You'll also need to have read these notes to complete an upcoming quest, and it's easier to do it now rather than come back later. Finally, read the spellbook to learn Safe Travel Lv.3. 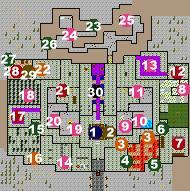 The large central area of Erika's Tower is her chambers. There are two doors leading into it, both requiring Unlock Doors Lv.3 to get into the antechamber. In each of the antechambers is a rune on the floor. I've never found any way to get past these runes, though I've read suggestions about how it's possible. However, you aren't meant to get into this room, and even if you do, there isn't anything in it, so I've chosen not to go into how you can enter the room. That completes Erika's Tower, and it's now time to head to the Portal Fortress and down to the Tower of Magi to get your reward for completing the Slime Quest.